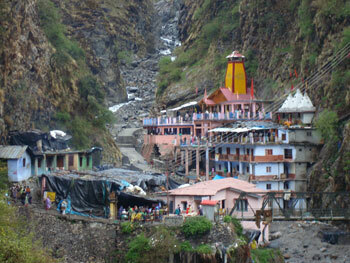 Yamunotri temple remains close during winter times. The temple opens at the starting week of May month on the religious day of Akshaya-tritya ( based on Hindu calendar ). It closes on Diwali festival day which fall in the month of October. During the closing of the temple in winter the goddess Yamunotri is kept at Karsali village. The pujari or Pandas of this temple are from Kharsali village. There are some different routs but from Mussoorie side the road passes in front of beautiful Kempty fall. After crossing Yamuna bridge the road goes through Nainbagh, Damta, Nowgaon. From Nowgaon the road divides in two, the right side road goes to Barkot, Hanumanchatti ( end of road & starting of trek), Yamunotri and the left side road goes to Mori, Purola, Sankri. The small town of Sankri is popular as base camp for many trekking routs of this area. The road further goes upto village Taluka and then trek route to Hari-ki-Doon valley. You can read more on this section in our Kedarkantha trekking details. There are many photo galleries available in our gallery section on this trek route. Nawgaon is at a distance of 171 KM from Haridwar. From Nawgaon the right side road goes to Barkot ( + 9 KM ). Then the road passes through Gangnani, Kuthnur, Paligad, Sayanachatti, Ranachatti and ends at Hanumanchatti. The trekking to Yamunotri starts from Hanumanchatti. 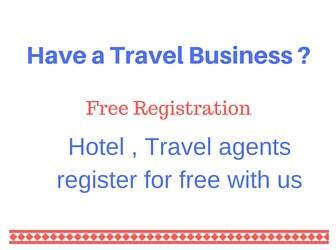 Here there are some private hotels and GMVN tourist rest house is there. Ponies and dandies are available here for the hill route to Yamunotri. In Char Dham Yatra , trekking is required for Yamunotri and Kedarnath temples, where as Gangotri and Badrinath Dham is well connected by road. Out of the two trek routs Yamunotri is difficult one if compared with Kedarnath trek. It will take 6 hours for a normal trekker to cover this hill road. The last half kilometer is of high elevation and most beautiful stretch of the trip. Distance of Yamunotri temple from Haridwar is 279 KM including 14 KM of trek in last phase.